You must make reservations at least 5 minutes in advance of the time at Millwright's. Ample parking located directly in front of the restaurant for our guests. Millwright"s offers separate locations for private gatherings. In various arrangements, we are happy to host parties from 15 - 120 for either small corporate gatherings or kitchen demos & full restaurant buy-outs. 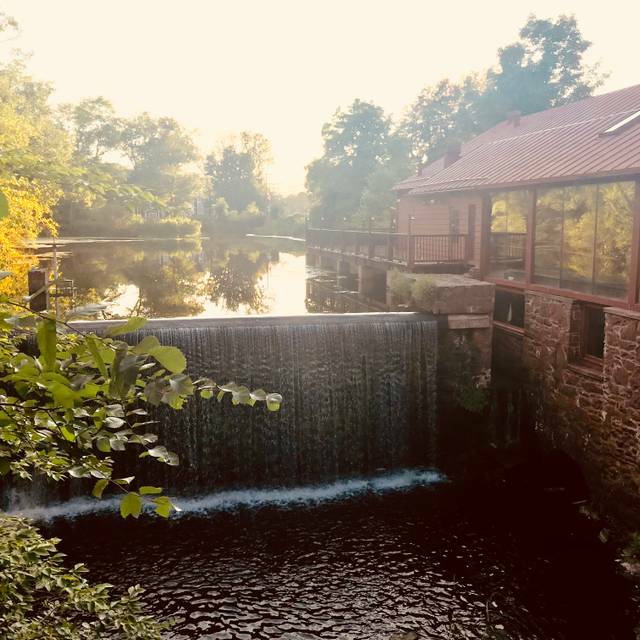 With its unique setting perched atop a waterfall in Simsbury, Connecticut, Millwright’s invites guests to dine in the 17th century mill with acclaimed, James Beard nominated Chef Tyler Anderson and his team. 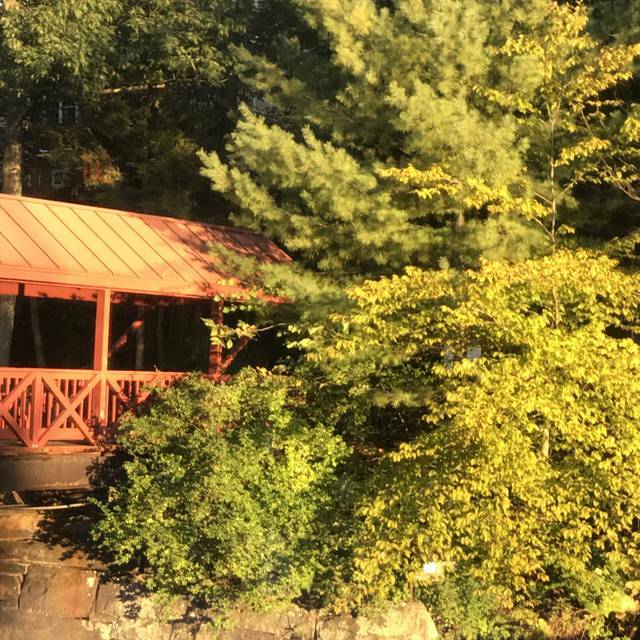 Featuring daily-chosen farm ingredients, the freshest and most select product, proprietary cocktails, and exciting wine menu, Millwright’s offers a new experience to the Farmington Valley farm-to-table dining scene. The culinary team understands the impact of the highest-quality fresh ingredients. Millwright’s kitchen thrives on local ingredients – grown, raised, produced, foraged and prepared – whenever possible. They also take the farm-to-table concept one step further. Millwright’s has partnered with a farm that will grow most of its organic produce. The “Inspired New England” cuisine at Millwright’s pays homage to the land, to the flavor-rich quality of local, fresh ingredients and to the time-honored cooking techniques that enhance the natural goodness of those ingredients. We loved the quiet feel of restaurant, it was a perfect place to spend our wedding anniversary. The 7 course tasting and wine pairing was an excellent choice (3 starters, 3 entrees, dessert and a few extras). From the starters, the Beet Salad was light and refreshing and the Tapioca Custard was a signature dish, one to definitely try. The Duck entree was tender and delicious. Service was well-timed, knowledgeable and friendly. The wine pairings skillfully made, explained, and accented the flavors of each course. We would definitely return, recommend it to our friends, and to you the reader. This place is special! Nice location and ambience. So beautiful, next to the waterfall with a nice view. The food is absolutely fantastic! Great products/quality and also great service. Very committed team! I'd recommend this place anytime! Hope to be able to come back soon! Thank you for this wonderful evening! Thank you very much for your review and for joining us on a special evening. We are thoroughly happy to know you enjoyed all aspects of your dining experience with us. We're looking forward to having you back. Have a great holiday weekend! Professional and welcoming staff, and a refreshing menu that was spot on from cocktails to dessert. I've looked forward to going to the upstairs venue for years and it exceeded expectations. The food was well worth the special occasion price. Lovely! Thank you Amanda for your review! We're happy to know that you enjoyed your first experience with us in the dining room. You're always welcome in both the tavern and dining room. Come back anytime! The first time we have come and not been happy with our entres. Hi Rick, Thank you for your review. Please never hesitate to speak up and share your thoughts while dining with us. We're always more than happy to remove the item and make you a new dish. This gives us the chance to correct any errors, but most importantly, this will help in allowing you to throughly enjoy your experience while dining with us. Last thing we want is for anyone to pay for a meal they were unhappy with. We're always here to listen to constructive feedback on how we can improve. Drove over an hour so we could experience the much raved about venue. Not overly impressed. The appetizers where tasty but very small protions. Our entrees showed a great deal of imagination but again was small and certainly missing something. Neither dessert was good mine actually went back. We can at least say we tried it but will not be back. Thank you for your review. The only way we can continue to improve is through feedback from our guests. We will share your sentiments with the chefs. If you wouldn't mind following up with us as to what dishes you received, we would greatly appreciate. Please let us know if there's anything we could have done differently for you during your experience with us. Looking forward to hearing from you. Thank you! delicious, great service, and surprisingly child friendly for being such a nice place. a night out to remember!! We were taken care of by Kris, who was very understanding to my food allergies(onion and garlic). She did a wonderful job checking in, but gave us space. Will be back, and we'll share our night out too. Appetizers were good,(salad and chicken dumplings), entree, pork and steak, solid serving size, roasted/crushed potatoes. Dessert, Carmel bomb and earl grey cloud with white chocolate. Big thumbs here. Overall, great nite out for two parents that tried out a new place. Thank you Joe for your review. We take food allergies and dietary restrictions very seriously. We are very happy to know that Kris thoroughly and properly communicated your needs so that you could enjoy your dining experience with us. We'll be sure to share your sentiments with her and the chefs. Thank you again for joining us and we look forward to seeing you again. All the best! The food was superb. Whoever is in the kitchen knows how to create masterpieces. I was surprised at how tasty the food is. What made my experience even better was the hostesses, ‘busboys’ and waitress. Everyone was friendly, helpful and respectful. I do plan to return. It was too much of an amazing experience with a breathtaking view. Thank you Nancy! We can't thank you enough for your sentiments. We will share your feedback with our chefs and the rest of our team. Hospitality should always be at the forefront of every dining experience; and we're very happy to know that you received the care and attention you deserve. We're looking forward to your next visit with us. This was our first visit to Millwright's and we were celebrating our 18th wedding anniversary. The staff went above and beyond with a card and exceptional treatment. They made it very special! We both ordered the 7 course meal and it was an incredible experience. We were blown away by the flavors, presentation, our server and the overall ambience. Thank you for making it such a memorable and special evening for us!! Highly recommend! We dined at Millwright’s recently for a family celebration dinner. Ron, our server, was more than helpful in accommodating our varied dietary restrictions. The food is inventive, flavorful, and fresh. The dessert was dairy and gluten free and yet— delicious! A beautiful rustic setting and a wonderful meal. Thank you very much for your review. We're thrilled to know that you thoroughly enjoyed your time with us. We will share your sentiments with the kitchen and Ron. Looking forward to your next visit with us. Thank you William for your review. Celebrating with family over a delicious meal is something to be cherished. Thank you for selecting us for your special occasion. We're looking forward to many more visits with you and your family. The service and the food was excellent. It was our first time there and definitely a place we will return to. Thank you Nicole!! We're always thrilled to have new diners who become our best regulars. Don't hesitate to reach out when you're ready for your next reservation with us. Have a great weekend! This was not our first time at Millwright's, as we frequently enjoy their downstairs pub setting (monthly/bimonthly), but the pleasant quiet and wonderful view out the wall-of-windows to the waterfall provided by sitting in a booth in the upstairs dining room was a nice "upgrade." Our server was wonderful, the beets appetizer "to die for", and our entrees (one fish, one lamb) both perfectly done and accompanied by savory "accessories" which were distinctively-&-memorably tasty. 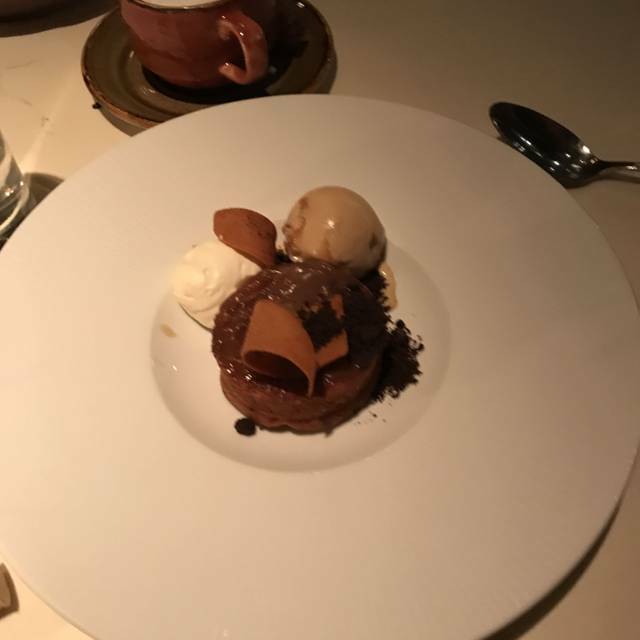 We enjoyed partaking of wonderful desserts, as well, which were too attractive to decline (our default option, as we're usually excessively sated, so desserts become a "burden"....! ), and worth the "extension." We'll certainly be returning! Good afternoon, Thank you very muck for your review and constructive feedback. We're elated to know that food, service and ambience hit the mark across the board. 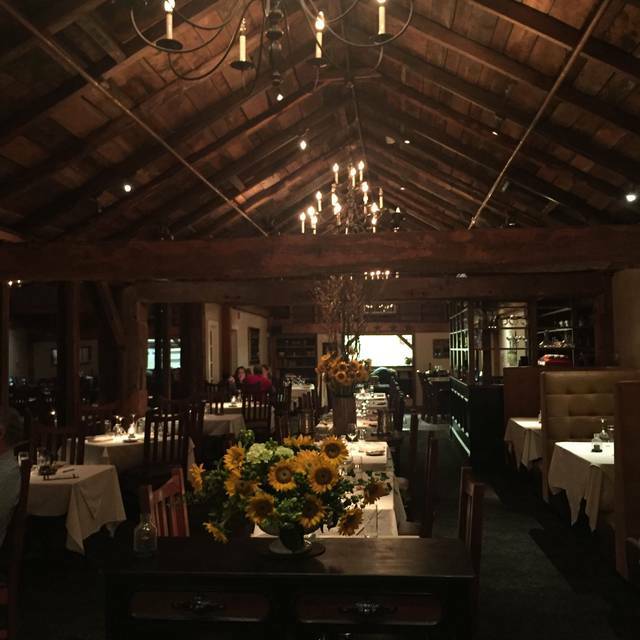 We're always happy to host you, in both the tavern and dining room. Thank you again for joining us. We're looking forward to your next visit with us. Disappointed in the pace of the tastings. Way too fast. Also asked two servers to put a candle in birthday boys dessert but no such luck. Food was ok but didn’t blow us away. We wish it was better for a very expensive night. Thank you for your review. We will share the pacing of the tasting menus with our chefs. We will always gladly adjust to a more comfortable pace for our guests. We apologize that you didn't receive a birthday candle. We traditionally don't have birthday candles in our restaurant. 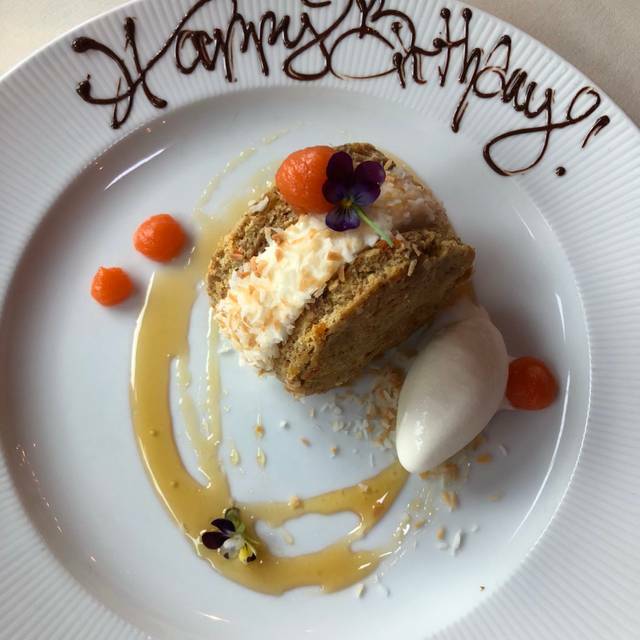 We do try and make these special occasions more individually unique by handwriting personal birthday cards and personalizing a dessert dish with "Happy Birthday" or a unique message of your own. My husband and I were married at Millwrights (then Hop Brook) in March of 1994, so we recently celebrated our 25th anniversary. Our daughter (who was our bridesmaid) and our grandson flew in from Texas to help us celebrate our anniversary. Millwrights was the perfect choice. Our seating preference near the waterfall was accommodated. The service was excellent, the food was delicious, and the prices were reasonable. So glad our special peeps were able to carve out the time to share this experience with us! Thank you for your 5-star review and kind words Cheryl! We're ecstatic to know that the trip down memory lane was elevated by good food, good drinks, and even better company. Don't hesitate to book your next reservation with us, regardless of special occasions. Have a great weekend! We have enjoyed dinner at Millwright’s on many occasions. However the brunch was very disappointing. We had over a 50 minute wait for our brunch plate. The sausage was dry and cold, the bacon was cold, the eggs were lukewarm the only thing Warm enough we’re the oversized breakfast fries. We missed the availability of some kind of toast with our eggs. All in all we would continue to enjoy dinner at Millwright’s but never a brunch again. Hi Barbara, We apologize on our behalf for your sub par brunch experience with us. We thank you for your constructive feedback in regards to the quality of the food and wait time. We will correct these issues immediately. Please never hesitate to speak up when you are dining with us. It offers us the chance to correct any errors. Feedback during our services is the best way for any team to improve. We never want a guest to leave unhappy. Feel free to contact the restaurant and ask for Vanessa. Excellent. Started downstairs with drinks then headed upstairs for dinner. Celebrated our nephews birthday and did the tasting menu paired with wine and it was an event. Amazing food, great wine, wonderful service ...an overall stellar experience. The ambience is sublime and the restaurant is incredible without feeling stuffy. 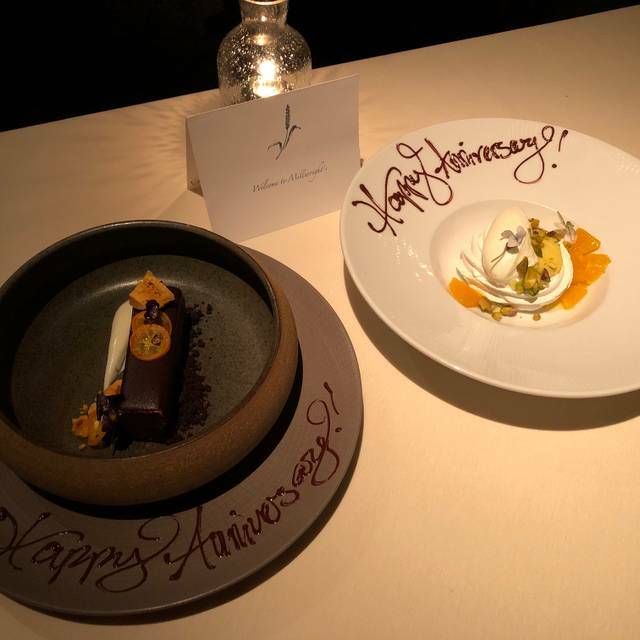 They are one of the best restaurants in the US we have ever experienced. Well done. Thank you for a great evening. Millwright's has made a small change in the format of their menu, but the quality of the food and service has not declined one bit. We all ate something different ( duck, lamb and scallops) and each person thought their meal was outstanding. The ambiance is lovely. 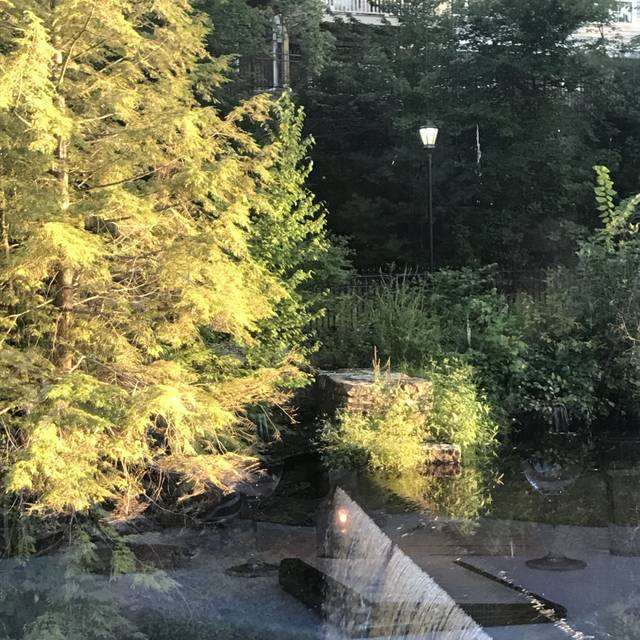 We had a window table overlooking the waterfall and we managed to spot the beaver who lives there, apparently for the first time this year. There were also fish leaping over the waterfall. Service was impeccable, helpful but not overly intrusive. This is, and will remain, our go-to place for special occasions and entertaining. Having been there many times, I have to say that the last few times have been less than stellar. First off, I dropped off my son and wife at the door while I parked. My wife and son were advised they would be seated after I arrived. Really? Is that necessary? Why the wait. Our server was, as she always is, welcoming and enthusiastic. We placed our order, and our appetizers were good...not great. Our entrees, however, were not good at all. I had the pork which was just ordinary. When I go to Millwrights, I expect special..I expect disappointment when I am finished, feeling I want more. My wife had the sword fish. First, the portion was minuscule, and second, the taste was awful. I even suggested to my wife that she return it and order something else. Just so disappointing. I hold the restaurant in the highest regard, but lately, I am not sure it deserves that. It has become ordinary, perhaps even less. We apologize you didn't enjoy your visit with us. We will continue to work with our service staff and share your food sentiments with the chefs. Please never hesitate to speak up when dining with us. We will always correct any mistakes. In regards to seating, we traditionally inquire if the party would like to be seated and we will always walk any remaining guests to the table. Please feel free to contact the restaurant and ask for Vanessa. I will ensure proper disciplinary action is taken. Food lacks seasoning overall. Wait staff were great. Went for a celebratory dinner/date night. Our waitress surprised us with a champagne toast for our good news. Cocktails were excellent and our meals were both top of the line. Waitstaff had a wonderful attitude, was very attentive but also allowed us to take our time. I look forward to going back! First, congratulations again! Thank you for your review and kind words. We're elated to know that our team made your experience that much more memorable and special for you. We're looking forward to your next reservation with us. Have a wonderful weekend! By far the best restaurant experience we’ve had in CT! The tasting menu is a must! Thank you for your review! We're happy to know you enjoyed all aspects of your experience with us. Looking forward to having you join us again. All the best! Took out of town guests... fantastic food wonderful presentation and service. Thank you for your review and feedback! Come back in soon, regardless of out of town guests. We're looking forward to your next visit with us. Have a great weekend! We have dined a Millwrights on many occasions and plan on more still. The food is excellent and the service impeccable. Marie our server for the evening was just wonderful and having the manger, Vanessa, stop by and chat about the meal is always helpful. The portions are not huge so if you like volume versus quality this might be your place. It is though one of the few places you can thoroughly enjoy three courses and not feel bloated. The food is very tasty. Thank you for your 5 star review Mr & Mrs Palladino! We're always happy to have you join us. Looking forward to your next visit with us. Have a great weekend! Thank you! Looking forward to your next visit with us. Millwright’s is a wonderful, fine dining restaurant which retains a very open and welcoming atmosphere. My wife and I got married at the upstairs function room and we still love to return, this time for our 6th anniversary. Food is inspired and wonderful people make the whole experience worthwhile. Thank you Millwright’s for your dedication to quality! Thank you Robert for joining us on all of your special occasions! 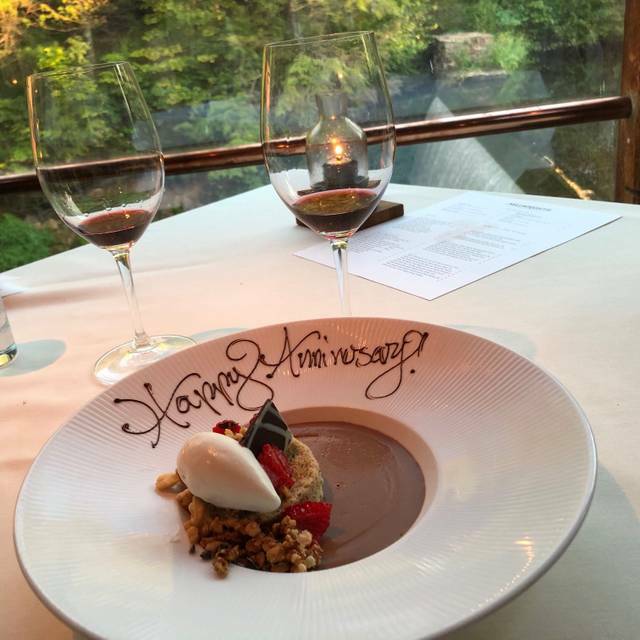 We're thrilled that you return every year for your anniversary celebration. Here's to many more anniversaries to come...! Thank you for spending your time with us. Thank you for joining us again! Looking forward to your next visit with us. Ron, our amazing waiter, is always helpful, fun and makes dining at Millwright's so wonderful. Went with a large group of 9 women for a work dinner. Great food, service and fun evening. One of my favorite restaurants in the area. Thank you for joining us for your work dinner! We were happy to host you and your guests. I will gladly share your feedback with Ron. He's one of the best in the business; we're lucky to have him. Come back and join us again soon. Thank you Elaine! We're looking forward to having you back! Expensive and worth every penny. Exceptional food for our brunch-- benedict served perfectly (which is tough to do), and all other components of the meal for three of us was just right. Quality shines through. Thank you for your 5-star review. Brunch is truly special; it's a real treat to sit in the dining room with all the natural sunlight and overlook the waterfall. We're looking forward to having you back. I'll be sure to share your review with our chefs as well. All the best! Thank you for your review and kind words! Looking forward to having you join us again. We're always happy to have you. our considerations were on the tasting menu, so we decided to go with that;only problem was the chef changed them. Good afternoon, Thank you for your review and constructive feedback. I'm happy you enjoyed your dining experience, however, I apologize if you were misled by any guarantees for the tasting menu. We will review service standards and verbiage with our team. 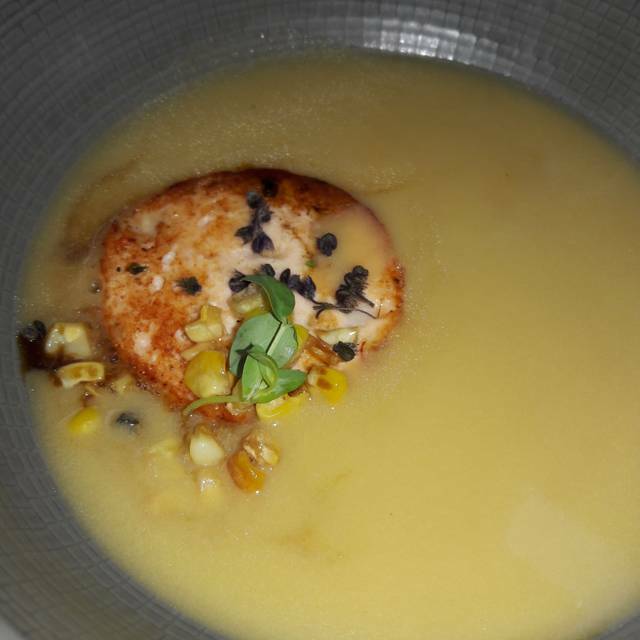 Though we can usually walk our guests through the tasting menu progression, we shy away from making any food guarantees. I apologize if this led to any inconveniences on your end. We're looking forward to you joining us again. All the best! Such a beautiful setting, excellent service, interesting and delicious menu. Fabulous all around. Thank you for your 5-star review. We're looking forward to having you back! Have a great weekend. A wonderful place for Brunch, a pleasant room, great view of the waterfall that likely once powered the mill in the building. Excellent waitstaff, and friendly people. Too bad it is about 130 miles from where I live. Thank you for joining us for Sunday Brunch. We wish you lived closer too. Don't be a stranger when you're passing through this neck of the woods. Looking forward to your next visit us. Please offer more Rhône valley wines and Chianti’s. Always a lovely evening when spending it with you. Thanks! Thank you for your 5 star review Diane! We will gladly share your feedback on the wine selection with our sommelier. We always value our guests' input and feedback. Thanks again!